My entity's users have CorpPass but are not able to access digital services. What do I do? a. On the menu bar > ‘e-Service’ > ‘Select Entity’s e-Services’, select the digital services that your entity transacts with from the list. You can also search for specific digital services by name, or filter a list of digital services by agency. - From your entity’s pre-selected list of digital services, choose the specific digital services you wish to assign to selected users. Note that Sub-Admin accounts with restricted access will only be able to set up and assign digital services within their Assignment Profile. After digital service access has been assigned to a user, certain digital services may still require additional details to be provided in order to transact with the digital service. Why can't I find the digital service I wish to assign to a Third Party Entity? Please also ensure your entity has selected the above digital services, before you can assign them to your service provider. For information specific to each digital service, please contact the relevant agency. What is Third Party Authorisation? The Third Party Authorisation feature allows entities to authorise their service providers (e.g. 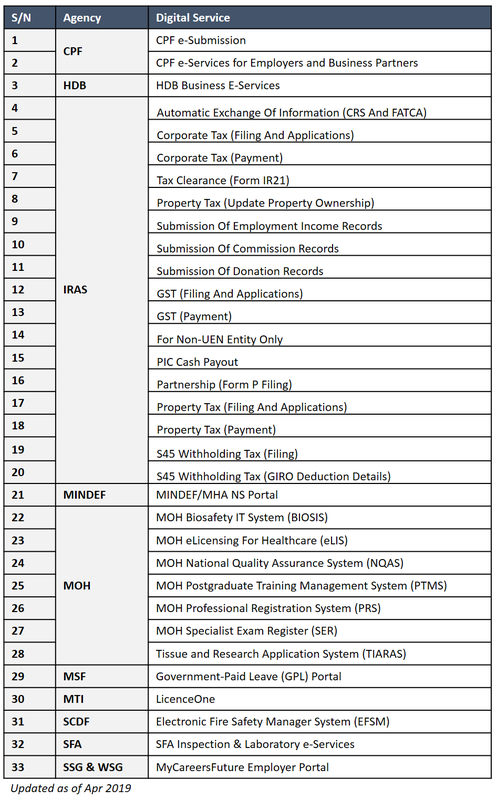 accounting firm, corporate secretariat firms, etc.) to transact on their behalf with Government digital services.